It is the time of year again where Lee Valley kicks off one of their free shipping deals. You need to spend $40 or more to get the free shipping, but LeeValley is one of my favorite tool stores so it is easy for me to reach the requirement. Fathers Day is also just around the corner, so if you order quickly you might be able to get your order in before the big day. The good thing about buying from LeeValley is that you know you are buying good quality tools, and many of the tools they sell are made in Canada or the USA. If you need some tool ideas from Lee Valley, click on the tag to find some of my past LV writings. 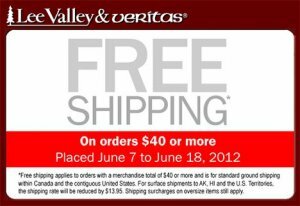 The Free Shipping offer ends June 18th, see Lee Valley for complete details.